Other single gene conditions only develop when the person inherits two mutations in the same gene on one of the autosomes – one from each parent. These mutations are known as autosomal recessive. An individual with only one copy of a recessive gene mutation does not develop the disease and is instead called a carrier. Some examples of autosomal recessive, single gene conditions are cystic fibrosis, Tay-Sachs disease, and sickle cell anaemia. In these conditions two copies of a mutation in the gene – one from each parent – must be present for a child to develop the condition. When a mutation exists in a gene on the X chromosome, an X-linked condition may result. An example of an X-linked condition is hemophilia. 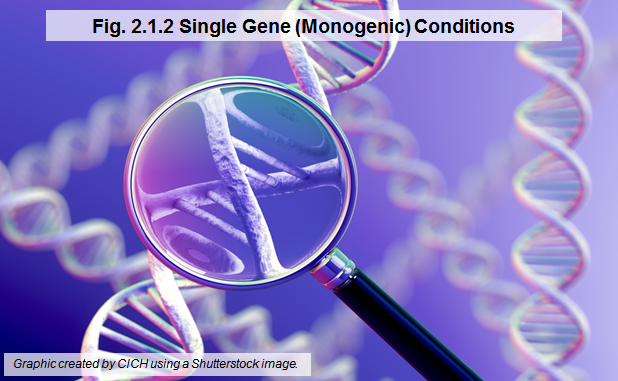 Single gene conditions (also called monogenic conditions) are caused by abnormalities, or mutations, of a single gene. These conditions can be severe or harmless, and though most are rare, some can be common. Familial hypercholesterolemia, a genetic condition that can lead to high levels of a harmful form of cholesterol, is an example of a common single gene condition.